The new SBS documentary reveals compelling new evidence, so there’s no better time to dive in to the case. If you’re one of the millions who were transfixed by the phenomenally successful Serial podcast, you’ll know these names: Adnan Syed, Hae Min Lee, Jay Wilds. But if you think you know everything about the infamous case of the disappearance and murder of high school student Lee in 1999, and the conviction of her ex-boyfriend Syed for her killing, think again. 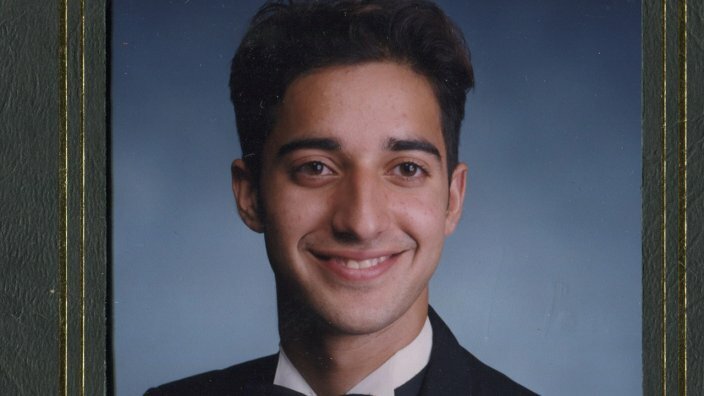 New SBS documentary series The Case Against Adnan Syed from Academy Award nominated director Amy Berg (West of Memphis, Deliver Us from Evil) presents potentially game-changing new evidence and reframes the story to focus on Lee. Episode 1 of The Case Against Adnan Syed is available to stream at SBS On demand now, and premieres on SBS Australia Sunday 7 April at 8.30pm. Before you jump headlong into the series, here’s a refresher on the major events of the case so far. Hae and Adnan in happier times, photographed at their high school prom in 1998. The documentary chronicles Lee and Syed’s romance that began when they attended the school prom together at Baltimore’s Woodlawn High School in April of 1998, and ended in December. The pair felt they had to hide their relationship from their conservative immigrant families. Lee went on her first date with new boyfriend Don Clinedinst on 1 January 1999. Lee, 18, was last seen alive sometime after 2.15pm when she left school. According to the documentary, she told close friend Debbie Warren that she was heading directly to pick up her cousin from elementary school and then to see Clinedinst. Her family reported her missing when she failed to pick up her cousin. Lee’s partially buried body was found by maintenance worker Alonzo Sellers in the woods of Baltimore’s Leakin Park, a notorious location for dumping corpses. She had been strangled to death. Syed’s mug shot on his arrest in 1999. The investigation saw several developments between the time of discovery of Lee’s body and Syed’s arrest. Among them, an anonymous call was made to police to investigate Syed as a suspect, just three days after the body was found; and police subpoenaed Syed’s mobile phone records leading them to his friend, Jay Wilds. Wilds told police that on 13 January, Syed had admitted earlier in the day that he planned to kill Lee and later confessed to him that he had murdered her, showing him Lee’s corpse in the boot of her car. Wilds said he helped Syed bury the body. In the hours before the arrest of Syed, 17, Wilds led police to Lee’s car in a residential parking lot in Baltimore. As chronicled in Serial, jurors overheard an altercation between Judge William Quarles and Syed’s defence counsel Cristina Gutierrez where he accused her of lying. Gutierrez’s request for a mistrial was granted. The prosecution had argued that Syed killed Lee because he was angered by the breakup and jealous of her new relationship. There was no physical evidence to connect Syed to the murder – the prosecution’s case for conviction relied on Wilds’ testimony, which as Serial detailed in episode five, proved alarmingly inconsistent. It also relied heavily on Syed’s mobile phone records and the corresponding mobile tower location data to provide corroboration of Wilds’ story. Syed has spent the better part of 20 years behind bars. Twenty years after Lee’s murder, Syed maintains he is innocent although as Serial explores, he had been hazy on the events of that fateful January afternoon in 1999. Wilds escaped jail time in return for his testimony and cooperation with the prosecution, and was instead given probation. The second appeal, filed in 2010 by Syed’s defence attorney Justin Brown, argued for post-conviction relief based on inadequate assistance from his original attorney, Gutierrez. Chief among the complaints was that Gutierrez had failed to call or investigate potential alibi witness Asia McClain who claimed to have spoken to Syed for 20 minutes in the school library at the same time the prosecution alleged Lee was killed on the afternoon of 13 January. In denying the appeal, the Circuit Court for Baltimore City found that Gutierrez’s decision not to include McClain was a strategic choice. The true-crime phenomenon hosted and co-created by journalist Sarah Koenig, captured the attention of listeners around the world. Downloaded over 175 million times, it created a legion of armchair detectives and has been credited with advancing the case. Lawyer Rabia Chaudry steadfastly believes in Syed’s innocence. Undisclosed: The State v. Adnan Syed, hosted by Chaudry alongside lawyers Susan Simpson and Colin Miller, took a more investigative approach to the case and included evidence not presented in Serial. Chaudry is a family friend of the Syeds and a tireless advocate for Adnan, and brought the story to Koenig’s attention. She’s a key figure in the documentary. A major breakthrough in Syed’s case, Judge Martin P. Welch of Baltimore City Circuit Court granted the reopening of post-conviction proceedings paving the way for evidence to be presented that would question the reliability of mobile phone tower data used by the prosecution to prove Syed was at Lee’s burial site. The hearing, which took place in early February of 2016, was also the long-awaited moment that Asia McClain, now Asia Chapman, finally testified. Based on the evidence presented at the hearing, Judge Martin P. Welch stated that Gutierrez had “rendered ineffective assistance” to Syed by failing to cross-examine the State’s expert on the reliability of the phone tower location evidence, and criticised her for not pursuing Chapman to be a part of Syed’s defence. Lee’s boyfriend at the time of her death, Don Clinedinst. There is a mountain of burning questions that the case has raised. Among them: who was the anonymous caller who gave the tipoff? Did the police coach Wilds’ testimony? Who exactly had Syed’s mobile phone on the day of the murder? Why wasn’t physical evidence tested for Syed’s DNA in 1999? Why wasn’t Clinedinst, and others close to Lee, properly investigated as suspects? Why did the police zero in on Syed so quickly? And will we ever know the truth? The jury is firmly out on that but we can tell you that The Case Against Adnan Syed uncovers some major bombshells including new DNA evidence. It raises questions about Lee’s death and burial, and confronts eyewitnesses with evidence that challenges their memory of events. And Wilds’ story takes yet another turn. It remains to be seen how the documentary will affect the case, but it undoubtedly takes the intrigue to a whole new level. Four-part series The Case Against Adnan Syed screens on SBS Australia Sunday nights at 8:30 pm from 7 April. The 4-part documentary series premieres on SBS on 7 April but if you can't wait, episode 1 is now available at SBS On Demand.